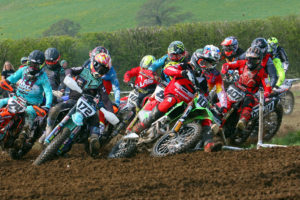 Enduroland hosted the 10th and final Endurofest event at their popular Chacombe venue which also saw round 7 of the Acerbis RaceXC Championships. Endurofest is Endurolands festival of off road and previously had 500 plus attendees hitting the tracks at Adstone, Daventry and now Seals Hill Farm. Although still a great weekend with up to 300 riders at the superb Chacombe venue the event entries have dwindled with Boss now calling time out on this particular event with 10 years proving sufficient and leaving a legacy of great memories. There will be similar future events, possibly at different venues but not under the festival guise. Great battles have ensued all season in all the classes with R7 proving no exception. In the 50cc/Auto class Eddie Belton took the win and a 2nd overall for the year. Riley Hill took 2nd on the day giving him the 2017 championship by just 1 point, with Kieran Maunder 3rd on the day. The 65cc class saw Jayden Westcott take the top podium with Jack Sandland in 2nd (overall 2017 winner) and Lucas Travers in 3rd. The 85cc SW class had John Stanley leader of the page once again with the season championship also in the bag and a cracking 2nd overall on the day. As ever Joe Cornelius wasn’t far behind in 2nd and very much up for rider of the season (attitude and personality) and Kit Szabo in 3rd . The big wheel class saw the battle of Chacombe youth and battles at every round this year between Kyle Saunders (on the day winner and overall 2017 champion) and Max Brown 2nd on the day and 2nd overall for the year. In 3rd place was Jayden Giles also having a very consistent season. The 125cc class saw Robert Wilson take the win with Olivia Knight in 2nd and a superb 2nd overall for the year, with Reilly Dennison in 3rd . A big lap was promised and delivered a cracking 90 minute race in almost perfect conditions. Whilst the adult and youth practice got underway at just after 11am the team looked now to the clubs Youth Endurocross X youth sprint which began at 1pm . The young guns got underway after a few laps practice on the X special test with noteable ‘big’ crash from auto pilot Kieran Maunder in the tricky tyre section. This sadly put Kieran out for the main 2 desperate sprint laps. Overall Endurocross X sprint Trophy Winner was John Stanley. The riders had great fun over the man made arena, with this arena event format possibly going to all rounds in 2018. On Sunday morning was the turn of the Adults riders in the 2 hour XC race and Adult Endurofest Trophy. A superb start from Brendan Griffiths ended in disaster after leading the whole pack the infamous ‘Chacombe whoops’ caught Brendan out and ended his racing for the day. The big adult lap included the far embankments (left out for Saturdays racing). Aaron Bloomfield took the lead and the overall Clubman Plus win with Aston Day in 2nd and Gavin Maggs 3rd . The Clubman had Ashley Page take the win with Simon Wright 2nd and young gun James Dover in 3rd. Previous winner in the class Tim Hammond got a puncture early on and sat it out till the finish . Chris Bailey took the youth win and William Gorringe came home 2nd with last minute entry Aiden Barnard a credible 3rd. The Vets saw another Darren Bedford faultless display with Mark Lewis 2nd place and Marcus Humphrey on the podium again in 3rd. In the Sportsman an elated Gary Curtis blitzed the race to take the win on the day with Ben Hovell and Carl Squire 2nd and 3rd . The Adult Endurocross X sprint Trophy results have already been posted with Darren Bedford taking the fastest lap -the vets Win and the superb SCOTT Sports holdall . A fabulous finale that will be missed in the off road bike world . Endurofest is dead ….long live Enduroland .